As of Thursday October 2nd, the Coastal Executive Unit (CEU) has a new Officer in Charge (OC). Superintendent Joachim Sabal has assumed the responsibilities of the previous OC Luis Castellanos, who is on training leave. 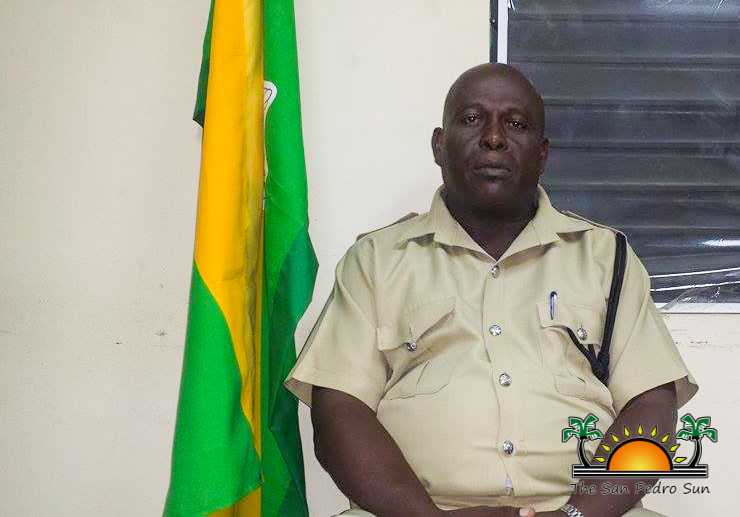 Formerly the Commander of the administrative department of the Belize Police Headquarters in Belmopan, OC Sabal comes to San Pedro offering 32 years of experience. He is no stranger to San Pedro, as he was previously in charge of this formation in 2005. Originally from the Toledo District, OC Sabal joined the police department in 1982. He is a veteran police officer, having held positions in almost all police branches, and in 2009 was promoted to Superintendent. The opportunities to work in several of the police branches has given OC Sabal vast knowledge on policing and maintaining law and order. “I have worked as the officer in charge of both the Internal Affairs Unit and Special Unit. I have also been the commanding officer of the prosecution branch. I hope that in my time in office here, I can use my skills to improve the San Pedro Police Department as well, and even pass down these skills to upcoming officers,” said Sabal. He has also worked at the Criminal Investigation Branch in Belmopan. He believes all officers should carry themselves with professionalism, pride and respect for themselves and others. “I know that the police in San Pedro are doing their best, even with the limited resources that they have. But that is no reason for officers to stray away from their responsibilities. While on duty, I will encourage my officers to work to the best of their ability in keeping the law and order of the community.” He also expects the community to contribute to the growth of the police department. “Without the community, there is very little we can do. We need to work together to ensure that San Pedro is safe. The police officers need the assistance of all residents. I ask all island residents to come on board with the San Pedro Police by reporting incidents and testifying against criminals. Right now I believe that the crime rate is under control, but there is still work that can be done to reduce that rate and have a safe environment for all. I’m here to work, not to vacation,” he ended. OC Sabal invites the community to voice out their concerns by visiting the San Pedro Police Station on Pescador Drive or calling (501) 206-2022. Persons are encouraged to report criminal activity immediately; anonymous reports can be made to Crime Stoppers Belize at phone number 0-800-922-8477. The San Pedro Sun joins the island community in welcoming OC Sabal and wishes him a successful term in office.